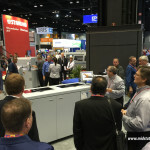 Graph Expo 2015 OverviewGraph Expo is a trade show in flux, in more ways than one. As the headline North-American exposition for the printing industry, it represents a changing marketplace. Changes like customer expectations, never-before-seen applications, shorter run lengths and quicker turnarounds make shows like this more important than ever. For those who haven’t heard, Graph Expo will be moving to Orlando in 2016 and the show will be held much later in September. This is a strategic move by the show organizers to help bring in more attendance from the Latin markets. Orlando International Airport is a great hub airport and coming landing place for flights from the south. 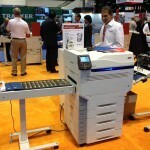 This year at the show we saw an incremental growth in the inkjet market. There were more inkjet engines than before and quality continues to improve. 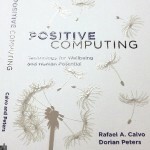 As inkjet matures it becomes more clear that web printing is the natural method. Inkjet combined with powerful VDP and inkjet software combined with roll-to-roll printing and roll-to-finish has become a huge draw for engineers in our industry. 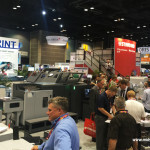 The Standard Horizon and Hunkeler booth was exceptionally busy with interested parties watching roll to book solutions and the New SmartSlitter. 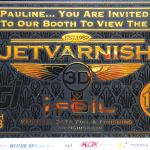 MGI dazzled passersby with their beautiful spot-coating and digital foil machine called the Jetvarnish 3D. 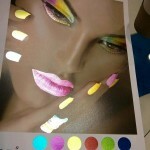 Oki demonstrated the New 5 Color C942 which prints a stunning white base color for unique applications on special substrates. We are all looking forward to next year’s expo in Orlando. 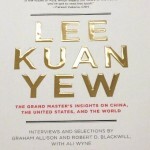 We’ll wait to see if there will be new energy from the changed venue and fresh audience. The schedule shows that in 2017 we will be back in Chicago for Print 2017. This four year occurrence is somewhat of a super show with a trend to international business and more foreign exhibitors. NEW OKI C942 in action! This entry was posted in Special Events and tagged Graph Expo 2015, Horizon, MGI, Oki, Overview, Standard on September 21, 2015 by Billi Jean Johnstone. Mid-State Litho and Jackson Area Career Center (JACC) are teaming up to help bring a new generation of Michigan Students into the printing industry. By raising awareness through new technologies, our Equipment Expo will inform, inspire, educate, and connect future industry professionals with leading organizations [you]! Join us on Wednesday, April 30th and Thursday, May 1st, 2014 – to explore new opportunities for today and the future. 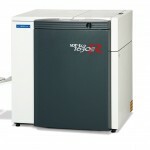 Featured equipment will include MBM, OKI Data, Morgana, MGI, Mitsubishi, Colordyne, and Foliant. MSL will be showcasing and providing live demonstrations for the latest equipment from OKI Data Solutions, Colordyne, Foliant, MBM, Morgana, and Mitsubishi. Special Guests include MBM Corporation’s, Phil Foss and OKI Data Solutions, Ted Schaffer. The OKI proColor series delivers high-quality and reliability with low operational costs – the affordable Digital Color Printer for your short-run on-demand color print needs. Fast, professional digital printer series with high quality color and vast media flexibility that levels the field and raises the bar. 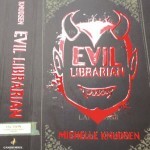 Eliminate label inventories with digital print. 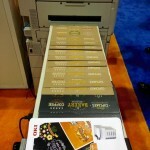 With the CDT 1600 C, print on demand has never been easier. Using digital print allows you to eliminate pre-printed label inventories and reduce costs. In one step, add color to your tags and labels, integrate variable data, and print what you need, when you need it. 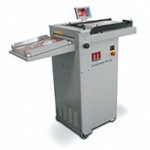 The Foliant Gulliver C-520A is a fully automatic industrial laminating machine with feeder, laminator and separator. It is equipped with a pneumatic system of laminating rollers, pressure with an easy thrust control, and a small compressor is integrated inside the machine frame. 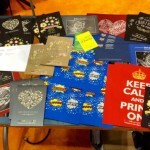 Slit, cut, crease, score, and perforate a wide variety of jobs including brochures, business cards, post cards, greeting cards, CD jackets, and etc. with laser sharp accuracy. 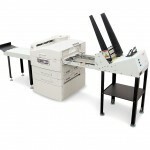 Ideally suited for digital applications, you can crease and score a wide range of stocks without cracking. The DigiFold Pro features Morgana’s patented flying knife technology which was developed to prevent the scuffing and marking on digital stocks that are caused by folding using conditional methods. 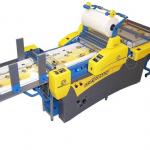 This creaser/folder can be used performing both functions in a single pass, as a stand alone creaser when folding is not required or as a perforator when creasing and folding are not required. 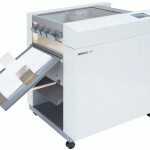 The AutoCreaser Pro series provides the complete solution to the problem of cracking that occurs when folding digitally printed output. 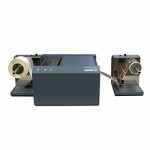 This automatic creaser is capable of handling conventionally printed card, laminates or cross-grained stock. The efficient, environmentally friendly SDP-ECO 1630IIIR platesetting system features a patented, self-contained processor that operates with two ready-to-use solutions for imaging Silver DigiPlate paper or polyester plate materials. This CTP platesetting system uses up two-thirds less chemistry and produces precisely the right plate for every job – one color, two-color or process color. This entry was posted in Special Events and tagged Colordyne, Foliant, JACC, Jackson Area Career Center, MBM, Mitsubishi, Morgana, Oki, Remote Demo on March 12, 2014 by MSL. 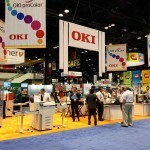 Oki – Makes Recycling Toners Easy! Click on the link, follow the steps provided, and print your label. Click on the link below to be directed to their website. This entry was posted in Uncategorized and tagged Cartridge, Oki, Rechargeable Battery, Recyclying, Toner on November 8, 2012 by MSL.